Pros: A laudable effort to remind us of the horrors of the war in Syria. Cons: A disjointed tale is upstaged by six real life goats. 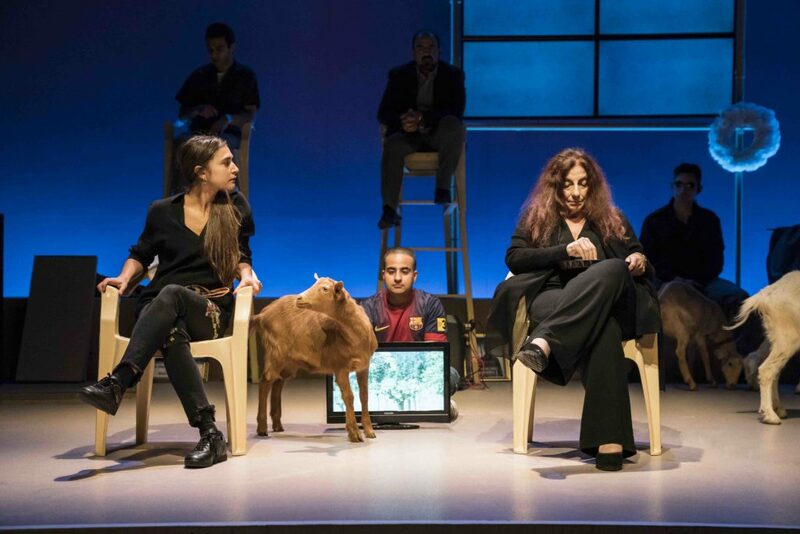 Goats starts with a strong premise and some powerful scenes, but a confusing narrative, a muddled set and patchy performances fail to do it justice. 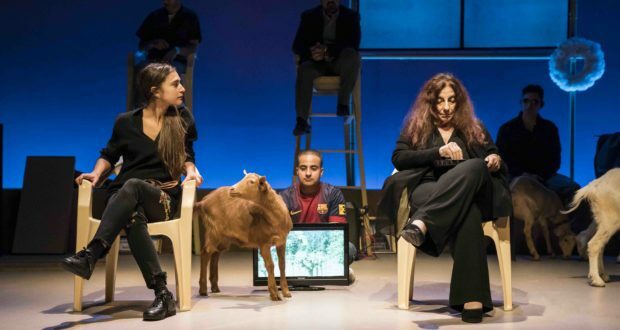 The narrative of Syrian playwright and documentary film-maker Liwaa Yazji’s Goats, currently at the Royal Court Theatre, is spun from the apparently real-life situation in war-torn Syria, being that families of sons and fathers “martyred” in defence of the motherland are given, as compensation for their loss, a goat. Government propaganda and saccharine news reports present death as a sacrifice and honour to be celebrated and rewarded. As the coffins pile up, one man questions the official narrative, and villagers are pitted against villagers as they search for truth and power in the face of a confusing, bloody war where a faceless enemy kills and tortures, and fake news abounds. It’s a bitter, promising premise. To the good intentions, then. 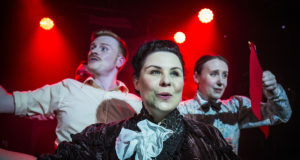 The Royal Court Theatre has a long-standing tradition of championing piercing political and cultural commentary, as well as a laudable programme to bring international playwrights into the spotlight. 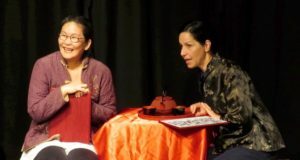 As reports about the war in Syria are increasingly being shunted to the back pages of newspapers, a play about the devastating conflict is timely and important. Unfortunately, this is not the play to do the job. While there are some forceful scenes – an ageing school teacher huddled over his son’s coffin, demanding the truth; the heart breaking, naïve conversations of teenage boys keen to fight; a suicide used to enforce the official narrative – the story is as opaque and muddled as the staging, which consists of a jumbled pile of ugly high chairs, television screens, coffins and – inexplicably – fridges. Throw in six real goats, and the muddle is complete. I admire Hamish Pirie’s audacity in bringing an animal known for its stubbornness on stage, but the four-legged actors managed to upstage the entire performance. That said, the distraction they caused might have been a clever point in itself; they are, after all, meant to distract the villagers from their losses. 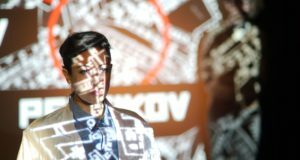 The best thing that could be said for the muddle of script and stage is that it added to the Orwellian confusion that reigns amongst the Syrian villagers as they try to piece together what happened to their sons: were they heroically killed in battle, or abducted and murdered? Are they perhaps not dead, but captured by faceless terrorist forces? Nobody seems to know. And the war rages on.